Size 8 Delicas are ladder stitched to form a base. Bicone crystals nestle just their points in the large bead openings on the sides. 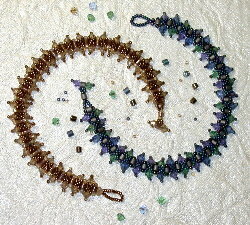 Tiny size 15 seed beads crisscross the surface adding interesting texture and color to this slinky sparkler.